Just lately the phrase ‘electronic-pop-music’ seems to equate to a vulgar form of over-produced dance music in some hands. But Nottingham-based synth/guitar/drums trio Cantaloupe are the antidote to this at times overbearing tidal wave. 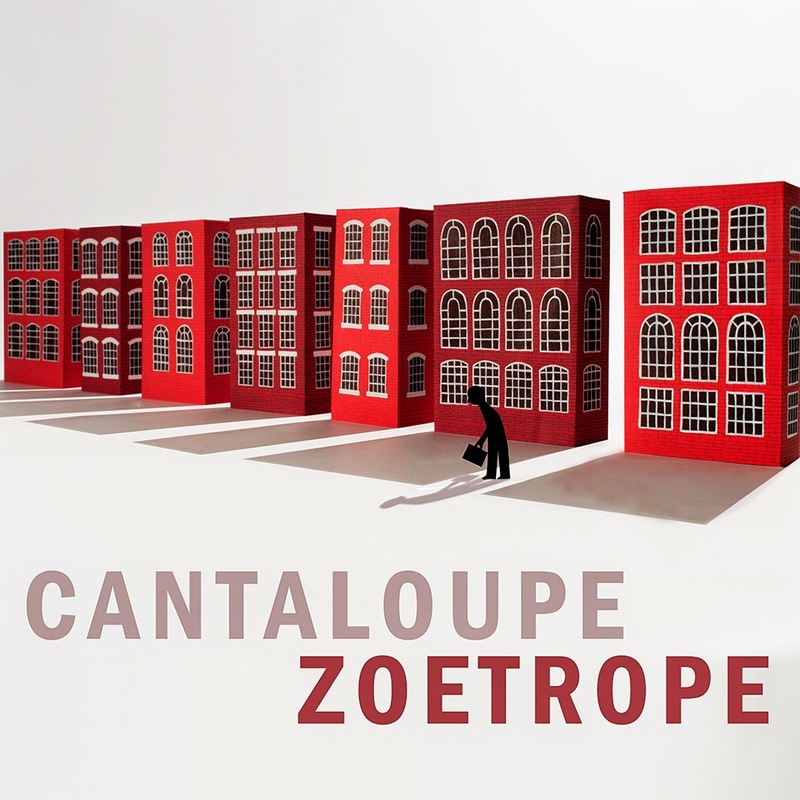 With ‘Zoetrope’ this trio let their imaginations run riot in the studio, with a refreshingly inventive, alive sounding pop record that creatively fuses playful beats with looping sample stings and quality vocal contributions painting a whole new world inhabited by enlivened beats and shining melodies. ‘Big Kiss’ bounds in brightly on a bed of drum loops and licks you all over the face like a springer spaniel, boasting a delightful effervescent pot-pourri of keyboards and samples, harking back to the playfulness of the big beat sounds of Mint Royal and Bentley Rhythm Ace, this is a delight. The sweeping synth-pop carousels of ‘Indigo’ meanwhile are more straightforwardly tuneful. With its suites of brightly coloured keyboard lines and decorated with the vocals of Tom A.D – his words personify the push and pull of a break-up (‘how I’m ever gonna let her go/my Indigo’) – the song rustles with the ghosts of Human League and Hot Chip. ‘Ambition’ simmers with a bass driven underbelly and spiralling Casio motifs. Vocalist Eleanor Lee’s vocals embody the contradiction of making your way up the career ladder, each note shimmering with a stately cleverness detailing that as it elegantly emerges in the intersection between early Saint Etienne and subtlety of The Knife. Live favourite ‘0891 50 50 50’ is riddled with wave upon wave of blinking samples, intricate synth lines and a happy hard-core beat. It is the sound of mid period New Order downing a strawberry milkshake on a very hot day. It’s bloody fantastic. ‘Ian Whitehead’ is a delightfully elastic instrumental that sounds like the theme from an imaginary ’80s kids programme. Dexterously percussive time signatures decorate the scene, while playfully imaginative keyboard lines and samples are joyously arranged into place like a tower of primary coloured blocks as they run through the entire lost and found of world music instrumentation. Having been on the road with the likes of Damo Suzuki, Acid Mothers Temple, Beaty Heart, AK/DK, RM Hubbert, Aidan Moffat, Blanck Mass, Cantaloupe have consumed their experiences and infused them all into ‘Zoetrope.’ It is eleven songs bulging with ideas born of their wonderful imaginations, crafted through expert execution and musicianship and bristling with their delightful dreams to colour the modern day drudge. It is proof positive that dance music need not be generic or formulaic, it need not narrow down the possibilities but can open the mind and broaden the canvas. It is a live sounding album that brings to life the genres that they love but never sounds burdened by them as it surfs the gamut of electro pop, krautrock and afro-pop, enlivening each one’s spirit with a modernity and a bold personality. So fling open your doors, put on your dancing shoes and give into the tricky range of treats and challenges that they have readied for your eager ears.